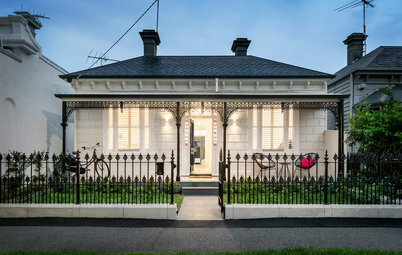 While it may be hard for most people to see the potential in a derelict building prior to any renovation work, two young developers who bought a historical house in Richmond, Victoria, knew they could have it restored to its former glory, and made perfect for family living. 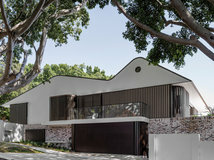 They chose Melbourne Design Studios as the creative team to modernise it, who did this by restoring the historic architecture at the front of the house and adding a contemporary two-storey extension at the back. 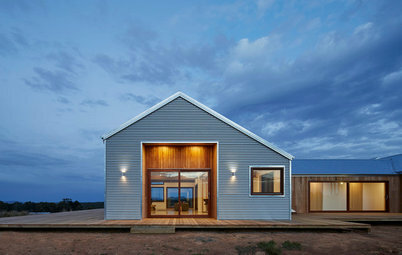 The end result is a warm and inviting 21st century home, now named the Waltham Jewel. 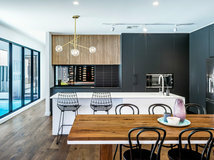 Purchased in 2011, the brief to the architects who worked on restoring this neglected home was to “create contemporary living with a heritage twist,” says Marc Bernstein-Hussmann of Melbourne Design Studios. 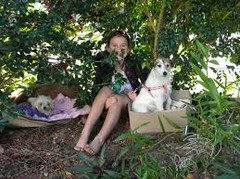 The developers also had the investment of the property in mind, and hoped to create value for the future. 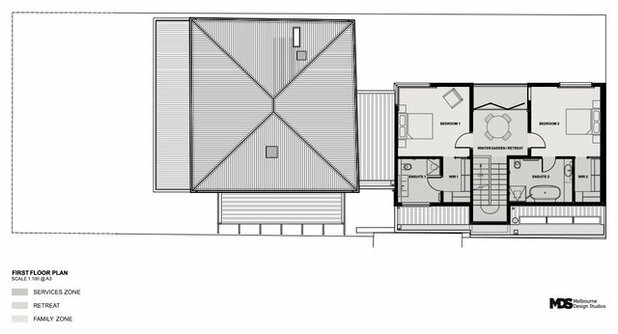 Before contending with the design process, Bernstein-Hussmann says the developers first wanted to subdivide the land to create townhouses at the rear. They also had to get council permissions to work on the heritage overlay, which took about 12 months. For Bernstein-Hussmann, it was particularly important to maintain the original frontage and return the Waltham Jewel to its somewhat original form. The building’s structure was not in great shape when the restoration began. “We were trying to keep the original floorboards, until we literally fell through them at one of our initial site inspections,” explains Bernstein-Hussmann. 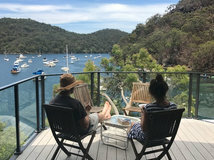 The floorboards ended up being replaced with spotted gum, a timber which was also used for the steps and outdoor decking. 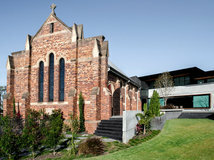 Additionally, some of the brick walls had to be stabilised to give extra support to the roof structure and new openings. One of the rooms in the original part of the house is the formal living room. 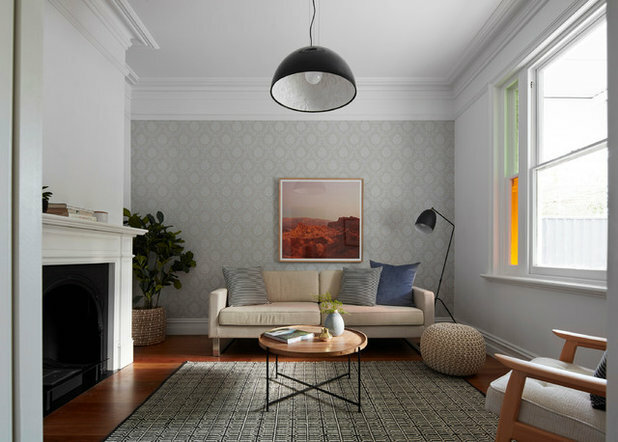 Bernstein-Hussmann added textured damask wallpaper by Wall Candy to reflect the heritage feel of the home. 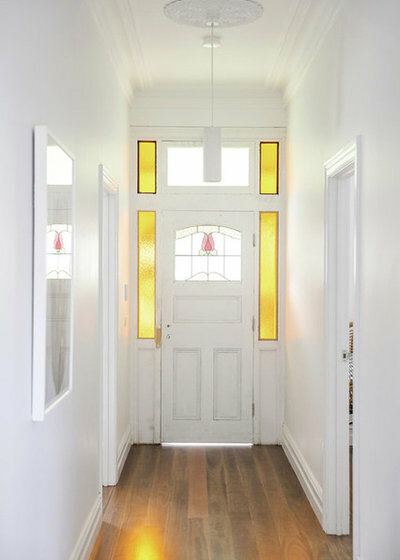 The restored stained-glass windows cast beautiful patches of coloured light into the room. To upgrade the heating in this older part of the home, a new biofuel burner by EcoSmart Fire was installed. 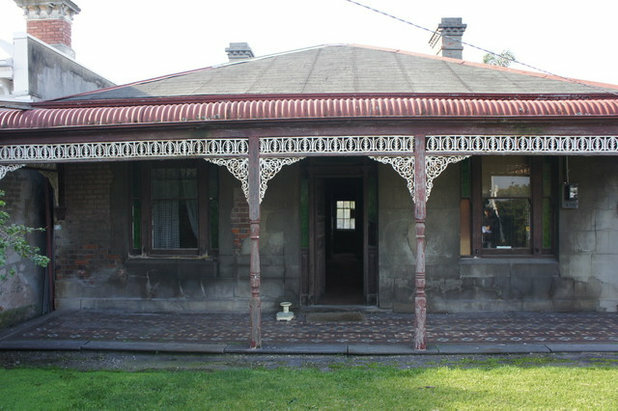 The bedrooms located in the original part of the house were kept simple, using traditional coverings, skirting and spotted gum floors. The home office is also located in this part of the house. A bench made of walnut veneer was mounted as a desk and can seat up to four family members. The window overlooks the garden from a working position. One of the rooms Bernstein-Hussmann is most proud of is the heritage family bathroom. Each of the features in this room work together to highlight the beauty in the history of this home. 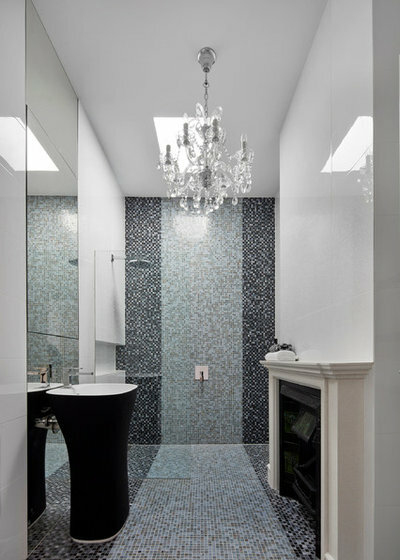 From the mosaic tiles and chandelier to the sculptural basin and original fireplace, which was also fitted with a biofuel burner, this bathroom has been lovingly remodelled. 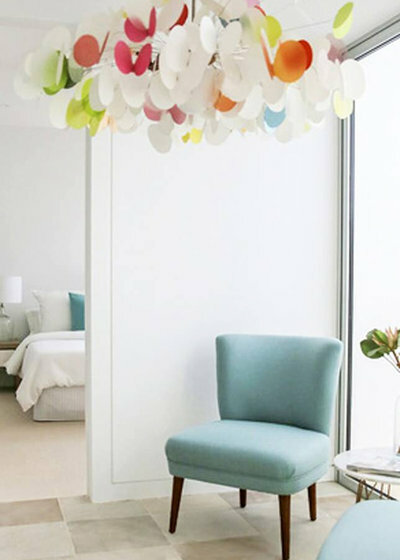 A skylight was added to ensure ample light reaches this room. 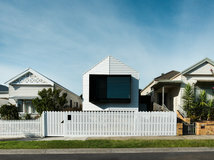 To distinguish between old and new, Bernstein-Hussmann added a ‘link building’, which steps down from the original Victorian frontage to the new extension. 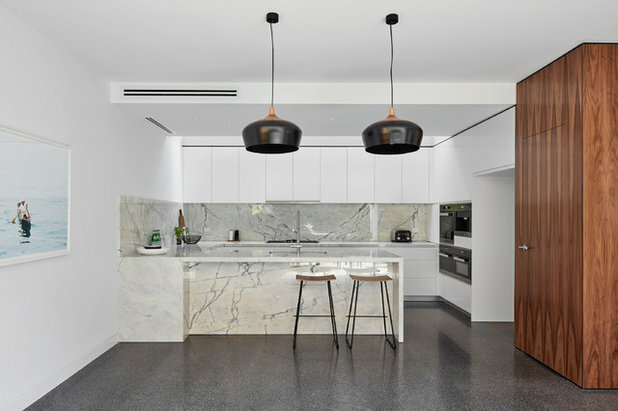 A walk down the spotted gum steps with recessed LED lights leads to the laundry and powder room on one side and a north-facing garden view on the other. 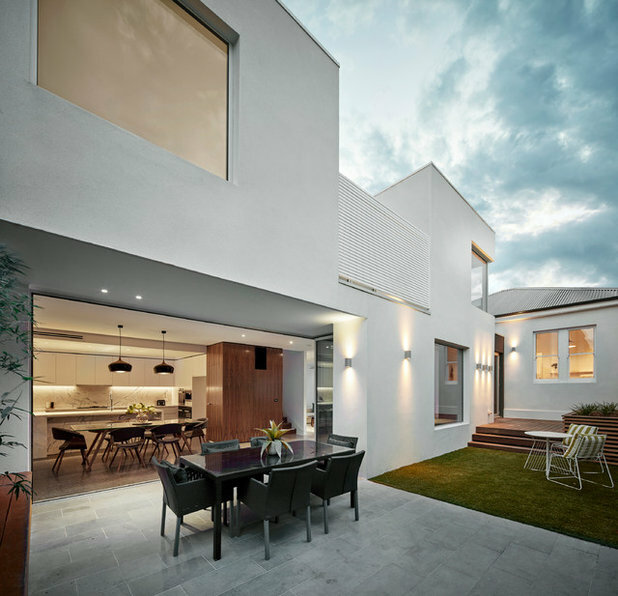 Large sliding doors separate the old building from the new. 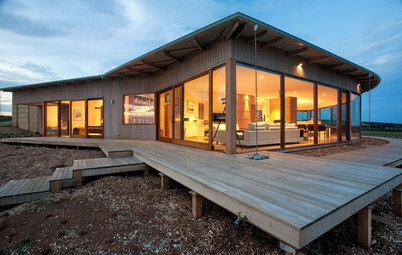 The doors slide back and can be hidden within the walls when open, allowing the space to flow, or be separated. 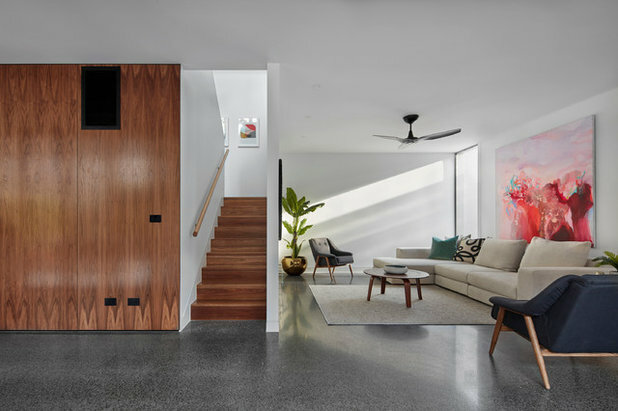 The family area is zoned into two halves by means of a staircase. The kitchen/dining area is on one side and a living room is on the other. 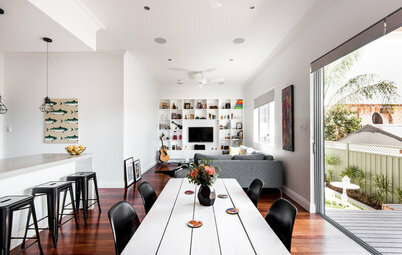 While it’s very much open plan, this layout helps the individual family areas feel a bit more cosy. 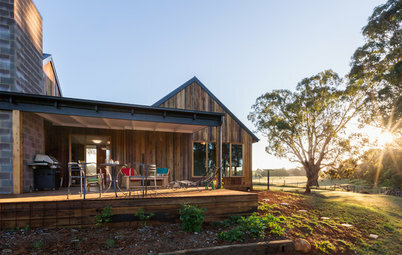 “The steps are made from spotted gum, with 90-degree tread/riser junctions for that extra sharp look beside the flush skirting with recessed shadow line,” Bernstein-Hussmann explains. 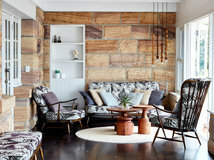 The biofuel fireplace, which is recessed into the wall, adds an inviting feel to the space. 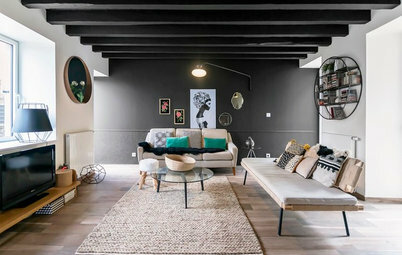 A west-facing window provides the room with sunlight. The space under the stairs is used as a walk-in pantry. 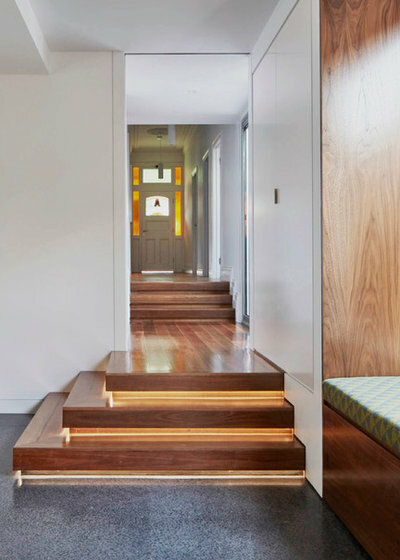 It is made of the same spotted gum as the stairs. 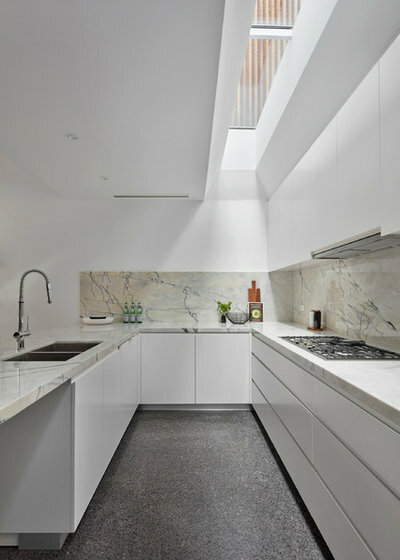 A long strip skylight was installed in the kitchen to allow sunlight to reach an otherwise dark area. 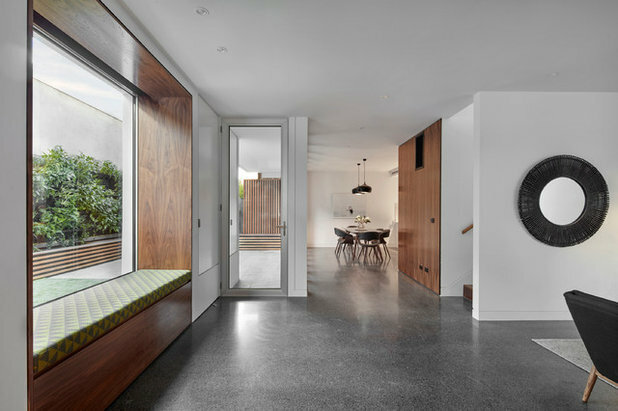 “Despite the minimalist approach, the project never feels cold, thanks to the choice of materials and carefully considered details, like the veneered upholstered window seat, which provides views to the north garden/green wall,” says Bernstein-Hussmann. There are also large north-facing glazed windows that make the most of the free solar heat during the colder months of the year. 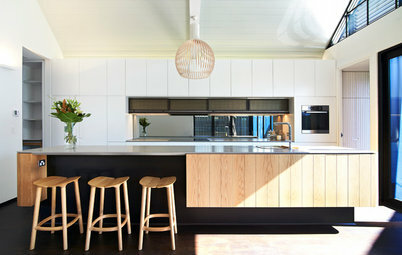 The black polished concrete floor also retains ample heat from the sunlight in winter, yet is cool underfoot in summer. 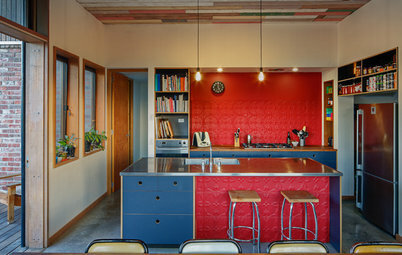 These aren’t the only environmental considerations in the building: a solar hot water system was also installed for the homeowners, along with highly insulated walls and ceilings. 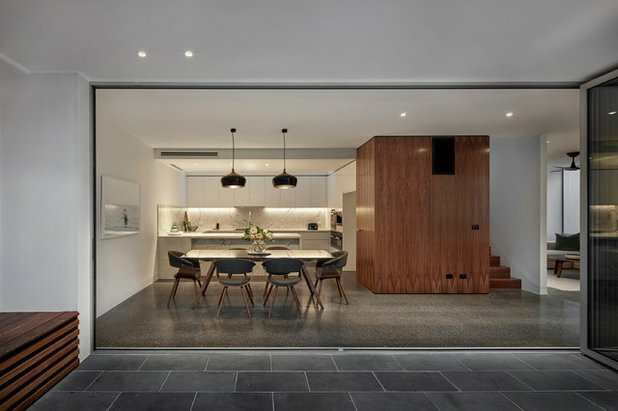 Large bi-fold doors open up the living area off the kitchen onto the garden courtyard. Bluestone paving was laid in the outdoor entertaining area to complement the colour and texture of the concrete slab floor indoors. Upstairs, the two other bedrooms are far more modern. 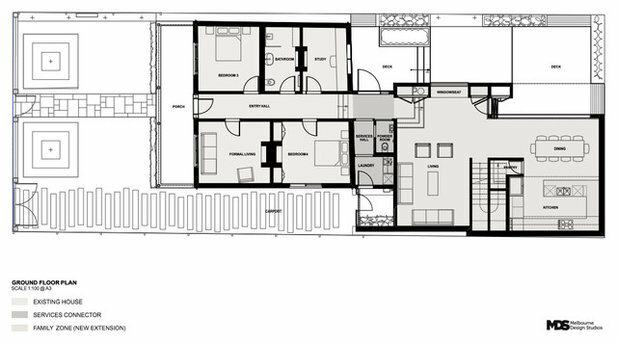 One bedroom has direct access to the balcony, while the other one has a large corner window. Walk-in wardrobes were installed, as well as ensuites. Finally, to make the rooms more cosy, woollen carpets were laid. The Bisazza mosaic tiling seen in the powder room downstairs was also used in the upstairs bathroom to give continuity to the two wet rooms. The freestanding bathtub is the focal point of this room. 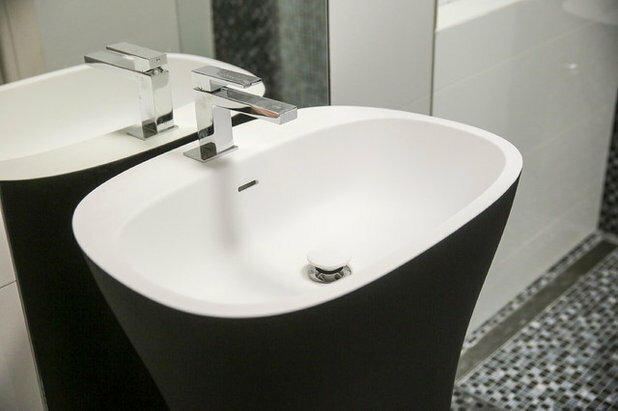 The Corian vanity unit designed by Melbourne Design Studios was made to complement it. 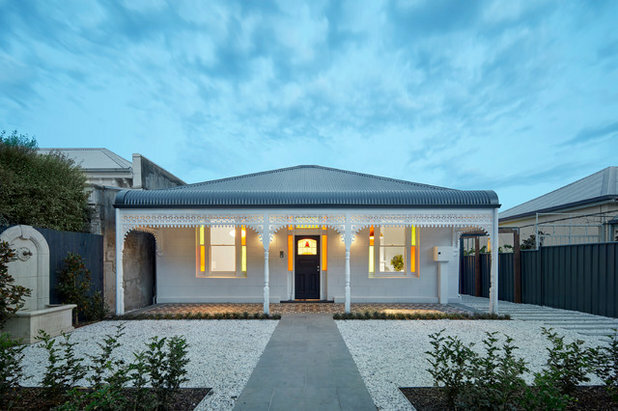 To sum up the transformation, Bernstein-Hussmann describes it as a “rags to riches story – the transformation from a forgotten Victorian house to the Waltham Jewel”. What do you like most about this transformation? Let us know in the Comments section.